SGL Carbon’s porous reactors can synthesize hydrochloric and hydrofluoric acids and destroy pollutants in industrial waste gases. The Ecopor porous reactor by SGL Carbon is a high-temperature system for the thermal decomposition of fluorochlorinated hydrocarbons (FCHC) in industrial waste gases. The system is also used for the thermal reaction of halogens, especially chlorine with natural gas. Destruction of CHC- or FCHC-containing waste gases in the Ecopor porous reactor typically takes place in an oxidizing atmosphere with a continuous supply of an auxiliary gas. The reaction products formed are carbon dioxide, hydrogen chloride and/or hydrogen fluoride, as well as water vapor. The auxiliary gas is fed in a specified excess quantity to shift the chemical equilibrium as completely as possible to the product side. 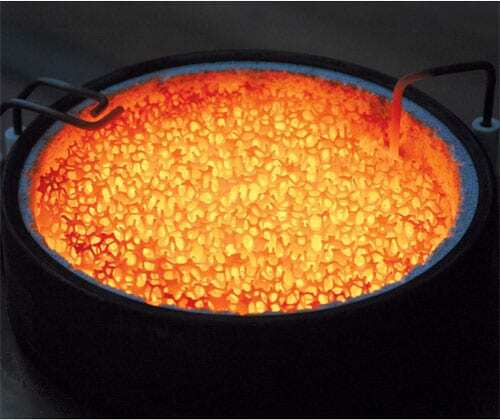 To enhance the porous reactor performance the good heat transfer properties of solid structures are used. The chemical conversion of the reaction feed gas takes place in the pores of the inert solid matrix, which consists of two zones that differ in their pore size and heat transfer properties. The pore sizes of the matrices are selected in such a way that chemical reactions take place exclusively in the reaction zone (zone C) in the direction of gas flow. In the other zone, the flame barrier zone (zone A), any propagation of flames is impossible; this zone prevents flame reversal from the reaction zone. 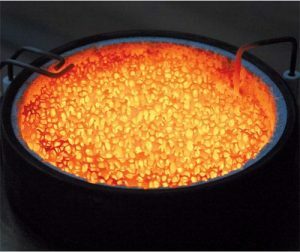 Appropriate transfer of the heat of reaction released is crucial to the proper function of the porous reactor. As the solid structure is a major factor in ensuring good heat conduction and radiation, heat transfer in this system is much more effective than in a free flame. Hence, the reaction volume is almost fully utilized for the high-temperature reactions. This means that the respective reaction chamber can be much smaller than in conventional systems. In particular, good heat transfer rates also ensure preheating of the gas mixture and homogenous radial heat distribution in the reaction zone. Zones A and C of the porous reactor consist of packing or foams made of a refractory and corrosion resistant ceramic material. The water-cooled shell enclosing both reaction chamber and gas cooler is made of graphite to prevent corrosion. The graphite shell is lined with a ceramic insulator in the area of the destruction zone. This ensures that the temperature of the inner wall remains high enough for the destruction reaction to be completed.